Kare Kano 2 | Manga Reviews ~ Ramblings of A Fob. I can now see where the high opinion of Kare Kano is coming from as being one of the staple series when it comes to Shojo love story. In volume two there are a ton of cliche devises such as angsty unexpressed love, popular/perfect couple, heroine’s woes and uncertainties, and what not – these are the qualities of your typical shojo series nowadays. Yet in Kare Kano’s defense its one of the early series that is of a slice of life/high school love story that incorporates these themes. Even though there is an array of series just like this today, Kare Kano’s circumstances shines brighter and better than its bretheren. Volume 2 explores the circumstances of Miyazawa and Arima’s relationship after the love confession we had from the first volume. True, we have seen most of the instances contained in this volume but what makes it such a pleasurable read is that how well the author handles the situation. Miss Tsuda makes this series as fluffy and light hearted. She made Miyazawa as endearing but at the same time relatable main lead. We all have our “vainess”, “dark”, good and bad side. Its such surprising how well the author crafted its main characters and how unbelievably real their feelings and their action. I find the “he said”, “she said” technique quite a terrific way to give much of an insight and balanced character growth to both Arima and Miyazawa. I just like the idea of he/she completes me and their different personalities. 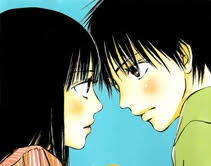 Its such a character driven series that explores the ups and down, good and bad aspects of a relationship. The bonus chapter is definitely spectacular, I like it very much we get to identify and emphatize to Arima much more. Both character is given an ample time to grow and develop as character. I don’t want to keep repeating myself as I think I have just written the same thoughts all over again so I’ll end it here. Volume 2 is proving that Kare Kano is such a stellar series. I can’t wait to see how the series plays out.. Hopefully it doesn’t disappoint. Crossing my fingers for the series to keep its light hearted atmosphere even though there will be “dark” twist in the latter parts – damn you spoilers.. I just want to mention that I love Miyazawa she still rocks! She’s sooo funny and likeable. Arima is alright but for now I’m a Miyazawa fan. So yeah, volume 2 of Kare Kano is easily Highly Recommended. This volume alone is pitch perfect.